This has been one of the manga series that I’ve been anticipating very impatiently, I enjoyed the first volume very much, and was eager to see how the story would develop in the second volume. 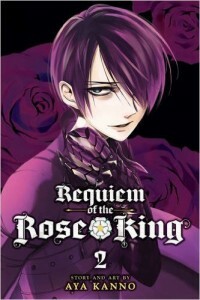 Kanno is still in the initial stages of developing the story, but this volume provides more insight into the psychological pressures afflicting the people who rule during the Wars of the Roses. If Richard didn’t have enough to deal with in the first volume, his situation grows even more unbearable when his beloved father is captured by the House of Lancaster and tortured horribly. Richard is left behind by his family’s army, left alone to deal with the torment of knowing his father has been captured. He crosses a line when he realizes that murder is the only way for him to gain the disguise and weapons he needs to journey behind enemy lines. Richard encounters Henry again when he’s struggling with the emotional aftermath of his actions. While Richard deals with his problems by enduring horrible visions and taking violent action, Henry’s passivity and desire to escape his responsibilities serves as a strong contrast to Richard’s more decisive nature. While Richard is clearly heading down a path of madness and despair, it also seems like his actions are going to have a strong impact on the world around him. Henry just wants to withdraw and allow his insane wife Margaret to make all his decisions for him. When Richard discovers his father’s fate, Kanno’s paneling decisions underscore the emotional impact. Richard’s face is shown with a blank expression with his eyes hidden to underscore the shock he initially feels, followed by single panels showing his whole face, zooming in on his surprised eyes and clenched mouth as he confronts his father’s death. Richard begins a transformation into the monster that people have labeled him as before, as he’s absolutely consumed by the need for vengeance. As the events later in the volume unfold, Richard is portrayed in a more and more stylized fashion, becoming a living embodiment of a curse and less like the tortured human the reader encountered in the first volume. The emotional stakes have certainly been raised in this volume, and Kanno’s illustration style is really stretched way beyond what I expected from the author of Otomen. There’s certainly more and more tragedy ahead, but Kanno’s take on the story of Richard the Third is a fresh and incredibly interesting adaptation. The tragedy and emotional trauma feels entirely justified and in service to the plot Kanno is developing. If you haven’t checked out this series yet, now is a great time to jump on and read two volumes with no waiting.